What title are we waiting for this week? Since we just had our first blizzard of winter here in NY and everything is still bathed in white, we thought a summer title would be fitting. 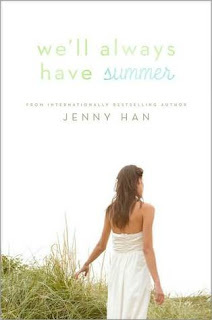 Our pick is We'll Always Have Summer by Jenny Han. Summary: It's been two years since Conrad told Belly to go with Jeremiah. She and Jeremiah have been inseparable ever since, even attending the same college--only, their relationship hasn't exactly been the happily ever after Belly had hoped it would be. And when Jeremiah makes the worst mistake a boy can make, Belly is forced to question what she thought was true love. Does she really have a future with Jeremiah? Has she ever gotten over Conrad? It's time for Belly to decide, once and for all, who has her heart forever (from Goodreads). We still remember how good the first two books (The Summer I Turned Pretty and It's Not Summer Without You) of this series were and can't wait to see what Han has in store for Belly, Conrad and Jeremiah. Don't you just love the covers in this series? How gentle they look but can convey the feelings and emotions of the characters inside? We'll Always Have Summer by Jenny Han, hardcover, 288 pages, will be published by Simon & Schuster Children's Publishing on April 26, 2011. Can't wait for this either! Loved the first 2 books! I haven't read this series, maybe I'll have to check it out. There are so many great books coming out next year that I can hardly wait to get my hands on!